That Naked Juice you probably picked up this morning on your way into work — thinking you were fueling your body with the goodness of fruit and protein — isn't as natural as you'd think. Due to conflicting ideas of what constitutes a "natural" product, PepsiCo. is stripping the juice brand of its "all natural" label. Back in June of 2012 Naked Juice was sued (Natalie Pappas v. Naked Juice Co) over false advertising with phrases like "natural" and "non-GMO" on products and online. The juices contain genetically modified soy and other ingredients that are far from being cultivated from the earth. 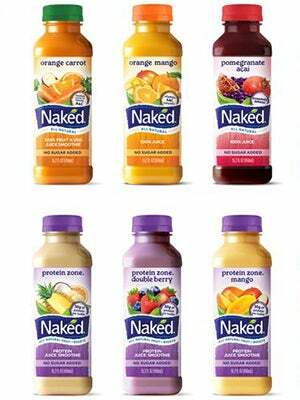 On July 2, Naked Juice settled the class action for $9 million, but still adamantly denies the allegations. Today, a spokesperson for the brand said they were happy with the result, and are continuing to focus on making "great-tasting and great-for-you Naked Juices and smoothies from the finest and purest fruits and vegetables." Photo: Courtesy of Naked Emerging Brands.